The drone market has achieved many amazing advancements in creating these aerial vehicles and adding important features in the last couple of years. FPV flying, aerial video shooting and photography have become extremely popular. However, most pilots are always concerned about flying their drone over water and this has led to making some drastic changes in the design of drones recently. There is always a possibility of your drone losing power when you are flying in FPV and are over water. However, you don’t have to worry about water damage with this new technology. The waterproof features on drones allow freedom of flight beyond backyards and fields to water bodies. Many of the recent high tech drones have been designed to be more rugged by making them waterproof. Considering a waterproof drone is an amazing idea, whether you are new to flight arena or a seasoned drone hobbyist. This list can help you find the best waterproof drone for your budget and needs. The package includes GPTOYS F51C drone, transmitter, 8 blades, 4 blade guards, 2 landing gears, screwdriver, 2 waterproof Li-Po batteries, charger, 4G memory card, card reader and user manual. The GPTOYS F51C is an excellent choice for waterproof drones. It is waterproof to the extent that you can drop it right into the water and fly back out. However, this drone is not only waterproof. It can also capture photos and videos under the water! It comes with a waterproof frame, motor, panel and camera. The drone also features a great drainage system because it has vents on the body that drain water from the quad quickly. This feature also allows the drone to submerge under water to capture videos and photos. The drone also has LED light on the body that makes night flying much easier. The drone’s body has been designed for rugged use. It also has a high impact resistant extra tough shell. The safe landing gear on the quad ensures lesser impact on its frame when landing and the strong blade protector provides efficient protection during crashes. Also, the waterproof motors allow the propeller to spin in the water without getting damaged. The F51C is equipped with a 3.7V 400mAh Li-Po battery that provides a flight time of 8 minutes. The battery takes about 45 minutes to charge completely. The waterproof drone is controlled by 2.4GHz control system and has 3 levels of acceleration mode. This makes flying for newbies and experts very convenient. It delivers a strong signal and powerful anti-interference performance so you don’t lose your quad. You can easily perform functions such as forward/backward, right/left and up/down with the controller. This drone can also perform 360-degree flip in all 4 directions. This model is also one of the best drones for sale with camera. It can be really difficult to find small quadcopters with camera for sale. However, the F51C fits the mark perfectly. The camera on F51C is built in to the front of the drone and sports an amazing 2MP. This offers clear and bright photos and footage and allows you to record still video and photography actions whilst the quad is in flight. The F51C is equipped the 6-axis gyro stabilization system. This system offers great stability when flying indoors as well as outdoors. It is also equipped with one key automatic return that automatically returns the quad to its starting point safely and fast, and a headless mode that automatically adjusts the position of the quad before flying. GPToys Middax F51C IS Waterproof! Coupon For RC items: RC15OFF 15 percent off! 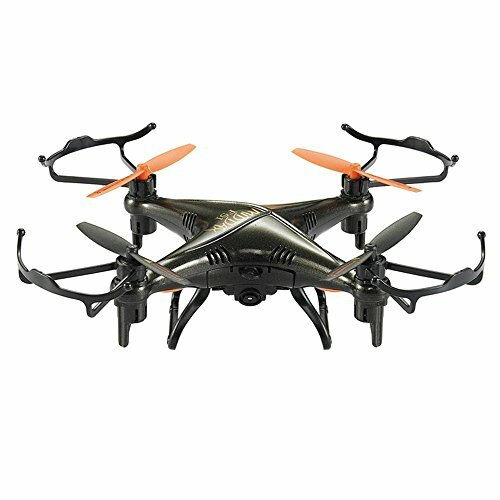 http://www.gearbest.com/rc-quadcopters/pp_415709.html?wid=21&lkid=10105610. The package includes the QuadH20 drone, painted body & arms, transmitter, carbon fibre legs with foam padding, FPV perspex dome, stainless steel fixings, black anodized ESC heat sinks, battery, charger, motor mount holes and grommets, spitzer battery cap, electronics and FPV tray, sticker kit and instruction manual. The QuadH2O is fast agile and waterproof and it is perfect for fun flying over water. It has a lightweight, watertight and extremely strong frame. Thanks to its protected body and gimbal, the QuadH20 allows you to ‘stick it out’ in the rain if you so desire so rainy days will no longer stop you from flying your drone. The drone has been particularly designed to fly over water bodies with speed and agility. It is great for shooting water sports such as speed boat racing and jet skiing because it can reach a speed of 40km/h. The drone does not come with a camera. However, it has been designed in a way that it can accommodate the GoPro action camera and FPV system for recording aerial videos anywhere you want. The drone is equipped with 4S 3700mAh Li-Po battery. When used with GoPro camera, FPV, etc it has a flight time of about 10 minutes. The battery takes about 60 minutes to charge completely. The drone is also equipped with LED lights which allow pilots to perform night flights. The QuadH20 can be remotely controlled using a DJI Naza controller and GPS. The controller remote allows a control distance of up to 100 meters. The drone has an enclosed casing. That’s why it has a built in heatsink that makes sure that the drone does not become too heated. The drone also features Headless Mode for easier orientation and the 360’ aerial stunt for fun acrobatics. The QuadH20 is definitely your best option if you are looking for a professional drone with a fairly reasonable price that is compatible with GoPro. 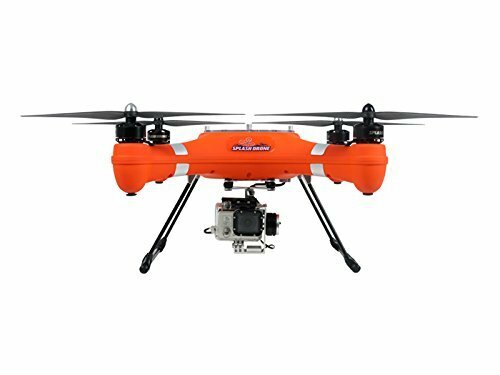 The package includes Splash Drone AUTO, waterproof gimbal with GoPro case, 4 propellers, battery, charger, 2.4GHz 8 channel remote control, payload release mechanism, video monitor and internal 5.8GHz video transmitter. The Swellpro Splash Drone Auto is a top quality, rugged and waterproof drone. 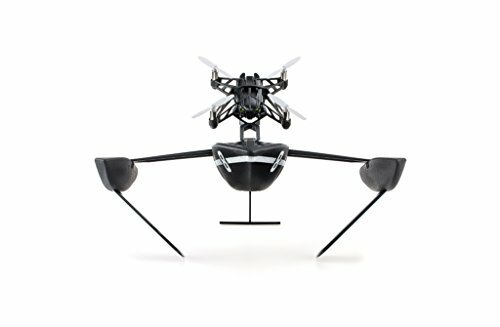 This drone is considered to be one of the most sought waterproof drones ever to hit the market. It has been designed to capture photos and videos above water as well as under water. The Swellpro Splash is fully waterproof, it can land and take-off in water, and it can even fly in the rain. It doesn’t come with a built in camera. However, it supports GoPro camera so all you need do is mount a GoPro or similar action camera and start flying! The drone also comes with an aluminium case. This case keeps the drone safe makes storing it and travelling with it more convenient. The drone is equipped with super strong LED lights that make night flying much easier. These lights are very useful because they also start blinking to show low battery warning. The drone comes with a 4S 14.8V 5200mAh Li-Po battery and has a flight time of about 20 minutes. It also has a payload of up to 1000 grams. The Swellpro Splash uses 590 KV brushless motors and self-tightening propellers for a smooth flight. This drone has a built-in 5.8G video transmission system. It uses a high-end 10-channel telemetry radio remote controller and a MI600s video transmitter. It has 1km of control distance so it’s easy to lose sight of your drone. That’s why it comes with three extremely useful return to launch functions (when the battery is low, when the drone flies out of range and when you press the button for it to return to where previously began flight). You can also use dedicated app to control this drone. The Swellpro Splash Drone also has some other useful functions, such as Way-point & Mission Planning flight, Circle Flight and Follow me mode. The package includes JJRC H31 Quadcopter, transmitter, USB Charger, sunglasses, 4 spare blades, screwdriver and instruction manual. The JJRC H31 is waterproof till 50 cm underwater. This feature makes it great for flying around water bodies without having to be concerned about water damage. Even if the quad falls into the water you can just pick it up and it will fly perfectly because its circuit board supports this waterproof function. 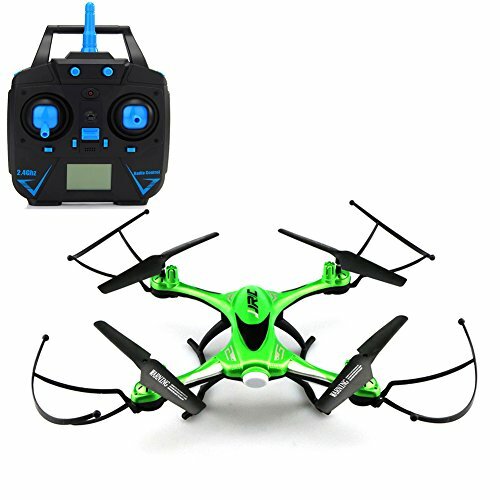 The build quality is amazing and as far as the color goes, this drone is available in bright green. This color makes the drone really stand out during flight and when it hits the water. Not only the JJRC H31 is waterproof, you will be surprised how affordable this drone actually is. In fact, the H31 is considered to be one of the best drones you can purchase for less than $50. The H31 is equipped with a 6-axis gyro system which gives it very stable flight and makes it easy to control. This feature allows you to fly your drone both indoor and outdoor. The JJRC H31 also has one-button return so if you lose control of the drone during flight you can bring it safely back to the point of takeoff. It also features a 2.4GHz control system that delivers a strong signal and powerful anti-interference performance to the quad. The drone is also equipped with LED lights so it can be safely used for night flights. This feature is very useful for pilots who are just beginning and want to learn how to fly. The JJRC H31 comes with 3.7V 400mAh Li-Po battery that has a flight time of about 8 to 10 minutes. The drone uses a changeable battery that is simple to replace and put in place. The battery takes about one hour to charge completely. The H31 is stable flyer and allows you to perform functions such as turn right and left, go up and down and forward, backward and sideward flight. You can also perform advanced manoeuvres, such as 360 degrees rotation. The drone also has some very useful features, such as headless intelligent orientation control, in which the direction of the quad depends on the pilot and not on the quad and also One Key Automatic Return in which the quad goes back to its starting point. The JJRC H31 does not have camera included by default and this is only drawback. This means you’ll have to purchase camera separately. The package includes the Parrot Hydrofoil Mini Drone, battery, USB cable, Hydrofoil structure, stickers, screws and user manual. The Parrot Hydrofoil is actually a 2-in-1, which means that you can use it as a drone or you can mount it on the boat to act as a motor. It’s designed for freshwater use and you can take it to a lake or calm river and enjoy the most of this fast boat. You can detach your drone from the boat when you are done swimming and start flying. You can remotely control Parrot Hydrofoil via a Smartphone app available for both iOS and Android. You can also download the FreeFlight app to access more stunts and manoeuvres. The drone is powered with 550mAh Li-Po battery that has a flight time of about 7 minutes. The battery takes about 25 minutes to charge completely. The Parrot Hydrofoil also comes with an on-board mini camera that allows you to take aerial photos during the drone’s flight. The drone can reach a speed of 10km/h on the water and 18km/h in air. Unfortunately this drone only has a control distance of up to 20 meters, not its best specification. The drone is equipped with the 3-axis gyroscope and accelerometer that work together to ensure ultimate stability. The Parrot Hydrofoil can reach a speed up to 10 km/h (6 mph) on water and 18 km/h (11 mph) in air. Sadly, you can only control the drone from about twenty meters away. As you can see, you can have a tremendous amount of fun when you buy a waterproof drone. It is also a really great hobby to take up. It is very important to note that, while waterproof drones are great fun, there are a lot more considerations that you need to take into consideration before buying one. This is why we have created this list – to help you buy the best waterproof drone for your needs.